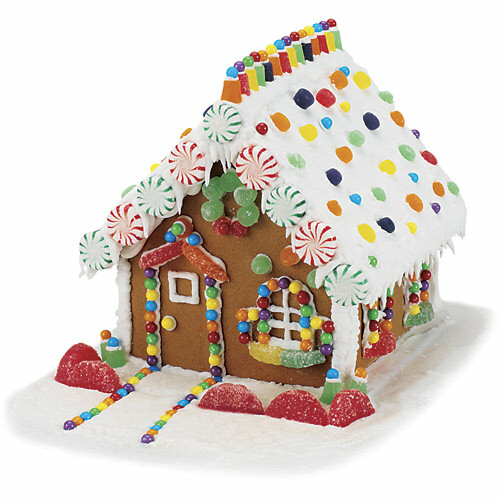 It’s that time of year again … Gingerbread House Making!!! This is a rerun of one of my “hottest” posts, which offers tips and a really good recipe to help you make a house of your own. Have fun! A couple of years ago I posted instructions on how to bake a gingerbread house that continues to draw a substantial amount of traffic. This year I’m making three gingerbread houses and five dozen oversized gingerbread men for Boosters, and after making gingerbread dough in those kinds of mass quantities, I was reminded of a few tips that I wanted to pass along to those who are new to baking this Christmas confection. * Use quality ingredients. Preferably Crisco (not all-purpose vegetable shortening) and “Grandma’s molasses.” This year I tried to cut corners by stocking up with the low-grade, no-name molasses. It turned the dough quite a bit darker than I was used to — and added a bitter aftertaste I did not like at all. Stick with Grandma’s (or possibly B’rer Rabbit). * Use foil or parchment paper (my favorite) to roll out the dough and bake. Roll on top of waxed paper to avoid using flour, to keep the dough nice and dark. Don’t forget to chill the dough at least an hour before rolling it out. * Use the touch test to check for doneness. It should spring back, without leaving an indent. Leave it on the pans for several minutes before moving it to waxed paper to cool. It will darken and harden as it cools. * If ground cloves are out of your budget (when I went to buy them, they were over $7/teeny, tiny jar that had barely enough for three batches), you can use allspice. * Use ROYAL icing to decorate — put 2-3 Tbls powdered egg white in per pound of confectioner’s sugar to get the icing to harden quickly. Then just add water to the right consistency. At our house, the Friday after Thanksgiving is Gingerbread House Day. If you’re going to adopt that tradition at your house, be sure to take a picture and put a link in the comments. Happy Thanksgiving . . . and Advent, too!